A beginner photographer asked me recently, “How or where do I focus for landscapes and what exactly does it mean when someone says ‘focus one third into the scene’? To be honest it’s something I’d wrongly presumed everyone understood how to do. Generally landscape photographers want a wide angle image with as much focus as possible from front to back. This is when they often set a large aperture number, for example anywhere between f/11 and f/22, then focus one third into the scene before taking the shot. Ok, now what does that mean exactly! For starters you need to set your camera to a single focal point and know how to switch between them. 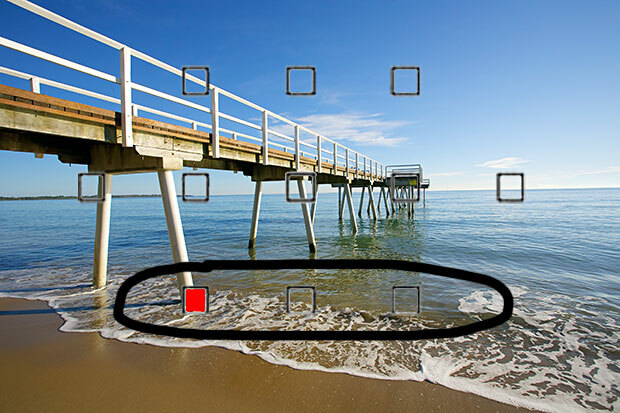 If you don’t understand how to do this, I suggest reading your camera manual or these tips on focal points. To focus for landscapes one third into the scene, I look through my cameras rear vision and choose one of the bottom focal points. Similar to the example image below. Note: For the focal points to light up you need to press your shutter button half way down. Then you will be able to switch between points, choosing one that is roughly 1/3rd of the way up from the bottom of an image. The depth of field extends roughly from 1/3 in front to 2/3 behind the focus point when shooting landscapes with this technique. 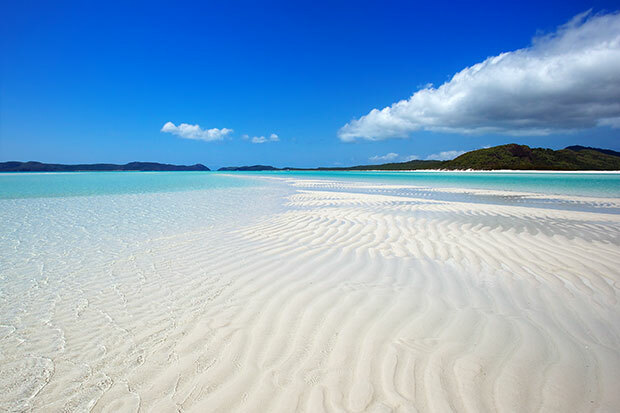 Therefore in this example shown above, everything from the sand in the foreground to the end of the wharf and horizon is in focus. What would happen if I focused on the horizon? If I were to focus on the horizon, the incoming wave in the foreground and the shine of the sand would have appeared much softer and therefore not as sharp. 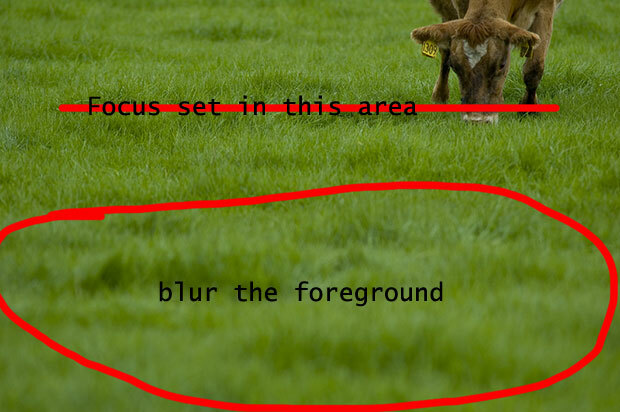 Many photographers use this technique to their advantage when photographing country sceneries for example and they want foreground grass to appear blurred like the image shown below. Remember, where you focus affects what areas of the landscape are seen in sharp focus, and what areas are blurred. For wide angle landscapes use the rule of focusing 1/3rd into the scene coupled with a high aperture f-number for sharp shots. What does sharp focus really mean? I recently had a beginner photographer say to me, ‘when I look at my images in full size, the trees on the mountains are never sharp, especially when I crop to the trees’. What this photographer meant was, the image isn’t properly focused because there is no details seen in the trees on the horizon. This is actually normal for DSLR cameras. They work very much like our eyes. Details are much more apparent on nearer objects than those much further away in distance. Take the first photo on this page for example. With my own eyes I could see the ripples in the sand, but not the details of the trees on the far mountains. Therefore don’t expect your DSLR camera to show details either when cropping the image to the trees. It doesn’t mean the image isn’t sharply focused from front to back, it simply means just like your eyes, that is exactly how the camera saw this particular landscape. There are cameras on the market that can give great detail from front to back, such as Hasselblad and Phase One. They are very expensive and usually out of the range of the average photographer.